January was a good month! I scrolled through the pictures on my phone and came up with 5 categories of things that I enjoyed this month. Here they are! 1// Snow! We got about four inches of snow on January 7th, and it lasted four days! I enjoy having a few cold, gray days that I can spend cooped up at home each winter. It’s just so cozy! 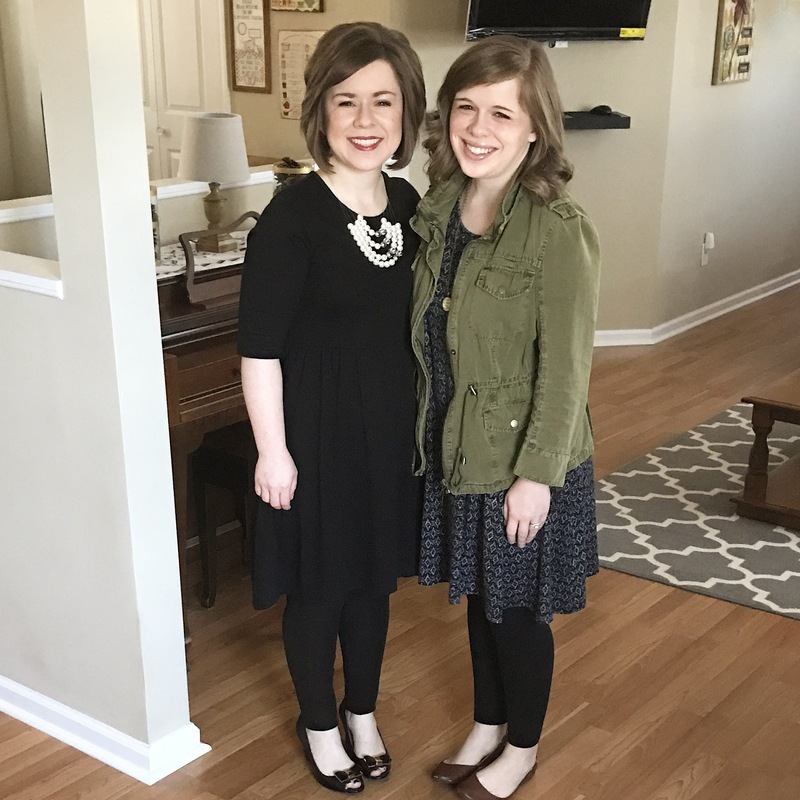 2// Alli’s Visit – My parents and brother in law went on a two week trip out of the country, so my sister spent a long weekend with me while they were gone. 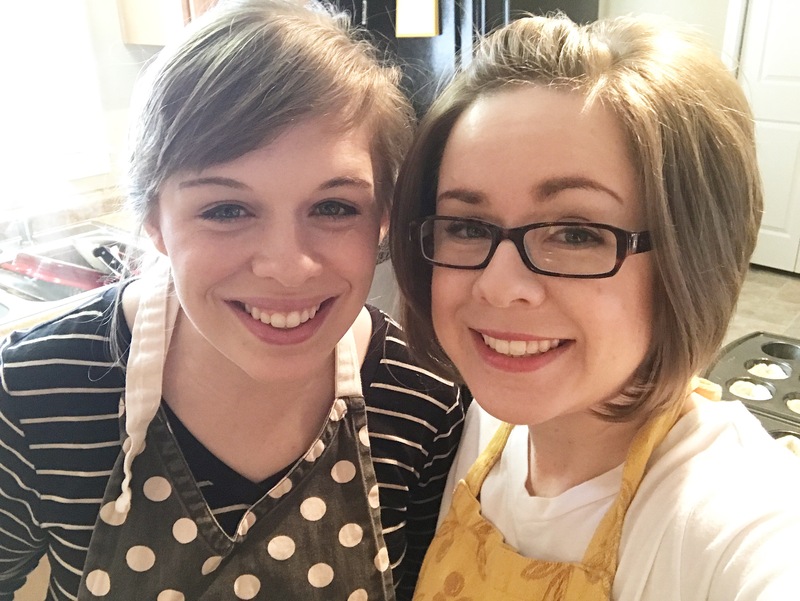 We had so much fun watching Castle, eating, shopping and laughing…and we even did some freezer cooking! 3// Special memories – Paul and I attended a gospel concert featuring one of my favorite groups. The venue is one that we’ve visited many times, and it holds so many memories from the past ten years of my life! It’s a little country church in the foothills with some of the kindest people you’ll ever meet. 4// The Inauguration of our 45th President – I don’t mean this to be divisive at all, but I’ve been voting in Presidential elections for 12 years now and in the words of Andy Bernard on The Office, “It just feels good to win one!” While I’ll agree the choice was a little unconventional, I’m a conservative and have high hopes for our new President. If nothing else, I’m incredibly patriotic and just enjoyed all the festivities of inauguration day. I love seeing all of our nation’s living Presidents and First Ladies seated on that platform (even the ones I didn’t vote for!). 5// Winter Outfits! We finally had some “winter” weather this month that enabled me to wear some of my favorite outfits. 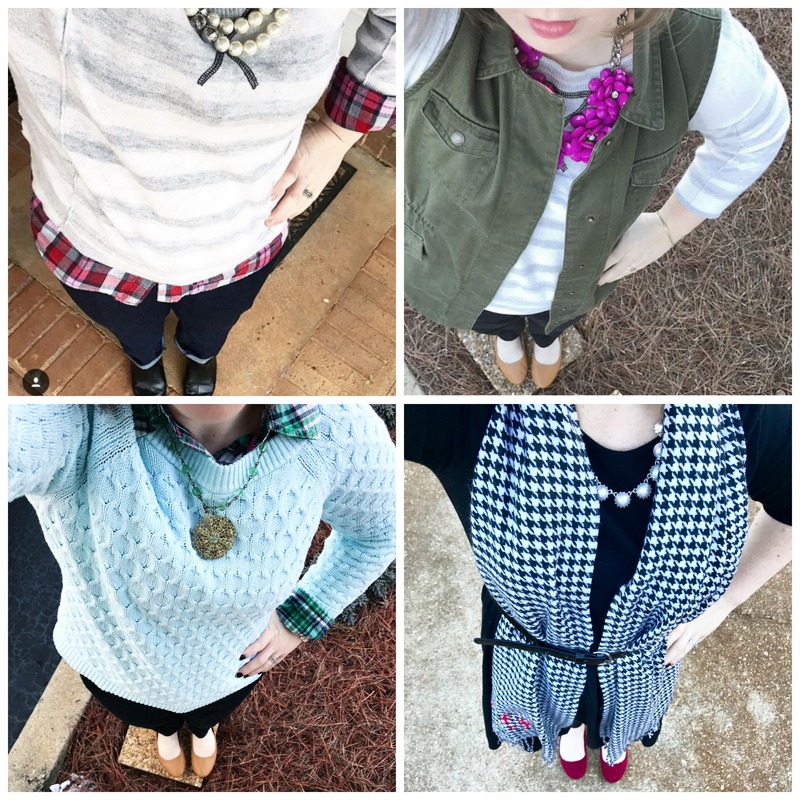 I love layers and they’re even better when they can be worn without sweating! The snow photos are so pretty! And it’s always fun to have sister time!! Have a great week! Thank you! I enjoyed our snow so much! #4 YES!!!! I agree 150% with you friend. I love that you had so much time with your sister. I hope my girls have a relationship like y’all do someday. Also snow!!!! I am so very, very jealous. It seems like it’s been a pretty mild winter for several of my friends in the Midwest! Hope you get some snow before Spring! January was a great month!! I love your round up and am glad you got to enjoy a pretty big snow. I was always wishing for snow when we lived in the South and it never happened. Love your outfits, that you got to spend a weekend with your sister and we really enjoyed all of the presidential festivities, too. Hope you have a great weekend! Snow in the South is such a big deal – I’m sorry you didn’t get to experience the festive yet panicked time that that is. LOL. Thanks friend, have a lovely weekend! Your outfits have been so cute! I’m happy we got a little snow, too! I’ve been really inspired by some of my favorite Instagrammers to work harder on my outfits. 😉 You’re definitely one of my inspirations! Glad you were able to enjoy the inauguration festivities, too! 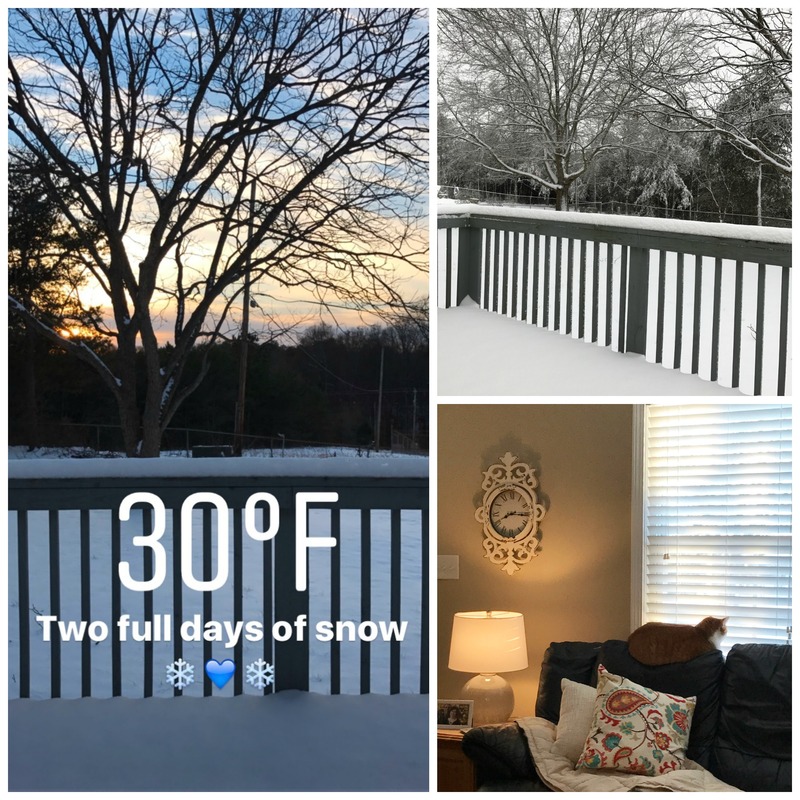 You’ve gotten more snow than us — that’s probably a first! I am sure it is a first!! That’s crazy! Ah the snow! It’s hard to even remember it when it was 70 this week! But it was so pretty to see out the window. Love that you got some time with your sister (a little jealous!). And you know I was watching the inauguration too 😉 It’s always fun to know someone else loves tradition and pomp as much as I do! I agree – seeing all the past presidents and First Ladies all together is just so neat! Have a great weekend! I know, it’s crazy when we have 40 degree temperature changes in two days!! Thanks Susanna! I love cozy lighting, especially in the winter. That’s Peggy’s new favorite spot and I think she’s worn a groove in the couch with her little fat self. LOL! Thank you, Jess! Winter clothes are my favorite! Thanks, Shelly! I’m so grateful for the relationship I have with my sis! It’s crazy that so many people who live north of us haven’t had any snow! Thank you, I am so grateful for the relationship I have with my sister! Thanks, friend! I usually enjoy January but it was fun to look back and remember all the fun things that happened this month! Hope you have a great weekend!